Demonstrating formal finesse, visual wit and disarmingly direct technique, the recent paintings of Olive Ayhens are a pleasure to behold. 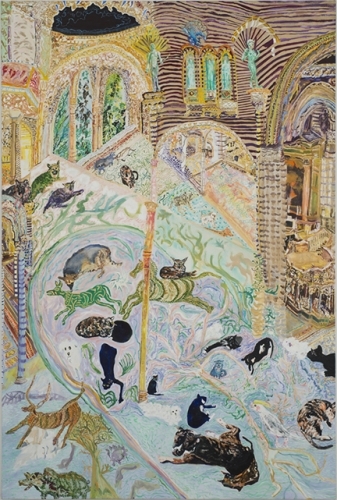 The profusion of anecdotal detail in this artist’s work (in particular, her obvious fondness for certain members of the animal kingdom) suggests a dreamlike narrative symbolism, but that doesn’t obscure the fact that she’s also an abstractionist of the first order. Ayhens trained at San Francisco Art Institute in the 1970s and has shown her work steadily ever since; Interior Wilderness, her current solo exhibition, is her second at Lori Bookstein Fine Art. Included are nine medium-sized paintings — in oil on canvas or linen, from the last five years — that attest to Ayhens’s command of her pictorial means: elastic or distorted space, a distinctive palette, and a willingness to allow realism to dissolve into pure abstraction. That these elements are knit together just a bit uneasily adds to the works’ power and charm. “Carnac” (2011) depicts the extensive Neolithic site on the coast of Brittany from an elevated vantage point, contrasting parallel rows of partially buried boulders with endless lines of tiny cars. Ayhens’s lively application takes care of the paint’s descriptive function with a minimum of fuss, yet the site seems inhabited by ancient spirits, as if there might be faces or figures disguised in the rock. The landscape itself is both stretched and flattened; abrupt diagonals connect the distant, verdant horizon to the foreground’s lolling cows and azure sea. More often, though, Ayhens uses linear perspective not to anchor space but to destabilize it, as in “Cockatiels and Crystals” (2013). An improvisation on the interior of Grand Central Station, the painting folds together opulent Beaux-Arts decorative flourishes, shimmering glass windows, polished marble floors swarming with tiny pedestrians, a bank of escalators, and of course those fabulous chandeliers. Dotting the canvas and surveying the scrambled scene are eight yellow-and-orange parrots; the painting’s bird’s-eye view places the gallery-goer right up there among them. Spatial contradictions are also productively managed in “Memories of Beasts Past” (2013). Dozens of creatures of widely varying shape, size and demeanor — mainly dogs and cats, but also birds, horses, an antelope, and maybe a water buffalo — lounge in companionable disarray across the floor of a curious, vaulted-roof interior that’s equal parts Northern Renaissance portico and Orientalized harem. The painting’s organization is engagingly incoherent in the upper half, where space collapses, while below, the menagerie of memory collapses time. Alluding to the cityscape of New York, the raucous, rollicking “Flecks in the Foam” (2012) features a panoramic view of the urban fabric as seen from offshore, rendered in the artist’s bustling style. At 59 by 67 inches, it is the largest painting in the exhibition. On the right side of this jumble of architectural types, an out-of-scale revolving door promises entry but goes who knows where; on the left is a vignette of a computer lab or command station festooned with an enormous tangle of multicolored cables. In the foreground, a monster wave crashes against a boardwalk, while nearby a cortege of police cruisers emerges from a cavernous garage. To the post–Hurricane Sandy viewer, the encroaching sea evokes global climate change, rising ocean levels, and general calamity. Like the work of Florine Stettheimer (whose paintings Ayhens’s somewhat resemble), these canvases are accessible and inviting but by no means a breeze to decipher. A savvy poker player, Ayhens keeps her cards close to her chest — not easy to do while also spilling out profuse and eccentric pictorial details. This contradiction is the work’s central, animating paradox. It’s unclear to what extent the artist’s subject matter is cultural symbol, narrative device, autobiographical marker, or just the fun of paint — as, for example, the mismatched pair of midcentury modern lounge chairs in the foreground of “Remembering my Chickens”(2010). Wine-red, they snap against a cluster of prickly cacti rendered in a range of greens, manically dashed and dotted in pale tints and near-white with a tiny brush: a painter’s joke about “touch,” perhaps. A splash of bright orange, the titular barnyard fowl hold down the lower right corner, while above and beyond them a hallucinatory hybrid of indoors and outdoors recedes into deep space. The exhibition’s oxymoronic title describes that fusion of imaginary realms, apparently borrowed from a painting of the same title. At the center of “Interior Wilderness” (2009–10) is a rippling pool edged with reeds, weeds, rocks, frogs, and a bit of unnatural tile work. The backdrop to this simulacrum of nature is a disorderly aggregation of period interior details — ranging from those of a Gilded Era mansion to a post-War warehouse — like some vaguely ominous Merzbau of the mind. As in Ayhens’s best work, a psychological dimension emerges in the painting, pointing the way to the interior, untamed wilderness of the artist’s subconscious imagination.